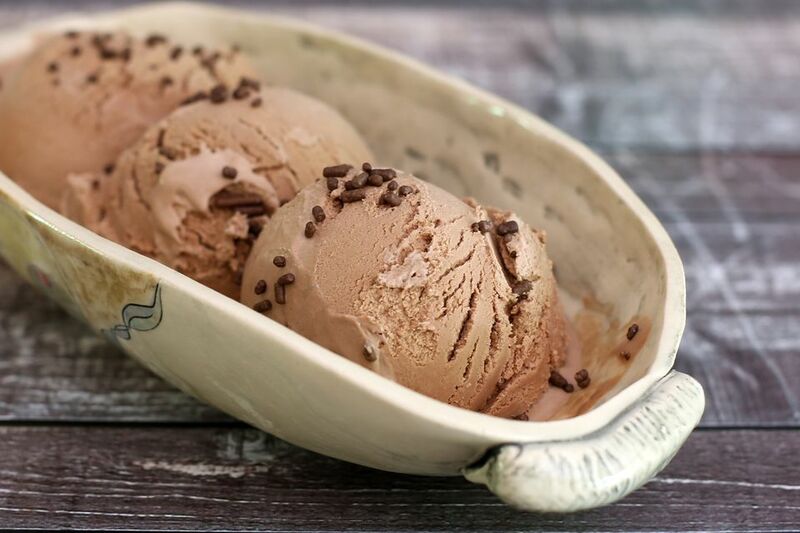 This classic chocolate ice cream is rich, creamy, and full of chocolate flavor. The ice cream is made with unsweetened cocoa in an easy cooked custard base. Let the custard mixture chill thoroughly before you begin churning. Feel free to add some chopped toasted pecans or chopped walnuts, or add a few teaspoons of espresso powder along with the cocoa for a mocha flavor. In a medium saucepan, whisk the cocoa into 1 cup of heavy cream. Whisk in the remaining 1 cup of cream, the milk, and granulated sugar. Whisk the egg yolks and a dash of salt in a small bowl and set aside. Place the saucepan with milk over medium heat and cook, stirring, until it begins to boil. Remove the pan from the heat. Gradually whisk about 1 cup of the hot milk mixture into the egg yolks. Add the egg yolk mixture back to the saucepan and whisk to blend. Place the pan over medium-low heat and cook, stirring, until the mixture coats the back of a spoon,* or to about 175 F on a food thermometer. Stir in the vanilla extract. *To test an egg and milk mixture for doneness, dip a spoon (metal or wood) into the mixture. Lift it out and run your finger across the back of the spoon. If the path you drew is clear and the film on the spoon is not running into it, the custard is done. Pour the mixture into a bowl -- preferably metal or glass -- and cover with plastic wrap. Place the mixture in the refrigerator and let it chill for at least 3 hours. Churn in an ice cream maker following the manufacturer's instructions. Transfer to a container; cover tightly and place it in the freezer until firm. Add 2 teaspoons of espresso powder to the cream along with the cocoa for a mocha flavor. Add about 1/2 to 3/4 cup of chopped walnuts or toasted chopped pecans just before the ice cream is done. Chocolate Chocolate Chip Ice Cream - Just before the ice cream is done, melt 2 ounces of semisweet chocolate with 2 teaspoons of vegetable oil. Put it in a small plastic food storage bag. When the ice cream is soft-frozen and almost done, cut a tiny corner from the bag and very slowly drizzle the melted chocolate into the ice cream mixture. The chocolate will harden in the freezing mixture.